Side A: The Titaness Themis stands opposite the Thracian goddess Bendis. Themis holds a torch in one hand and a tray in the other. Bendis is depicted as a huntress with a knee-length dress, fox-skin cap, deer-skin cloak, high boots, and pair of hunting spears in her hand. A deer stands at her feet. 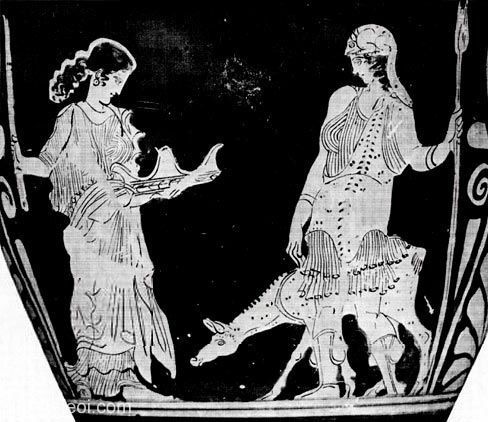 Side B: Artemis and the hunter Cephalus (not shown).